Perfect for snowbirds or family getaway, this house is a water sports, boating, fishing and golf dream come true. With 3 bedrooms and one murphy bed, you and your family and friends can enjoy the peace and relaxation of a quiet hideaway - all with being an hour or so to major Florida attractions. A couple of important notes before you read on. PLEASE NOTE WE DO NOT ALLOW PETS. If you are a long term renter we can make an exception, please discuss. We LOVE animals and have many - but this house is clean and pristine for all our guests including those with allergies etc. Also our max people is 7, no kids under 7 - unless non-mobile babies. Please ask if you have any questions :) This is due to safety issues with the nearby canal and boat dock. The St. John's river is 400 miles long with many parks, springs, side rivers to explore. It flows South to North and is spring fed, featuring excellent fishing for bass, catfish, tilapia, shrimp, crab and more. Boating is a dream here because the river is mostly surrounded by national forest and protected areas. It is not lined with many homes or developments. This creates an unspoiled experience on the river without a lot of boats or people to interfere with your peaceful time. Newly renovated and freshly painted, the house has 3 bedrooms and 2 bathrooms. There is one Murphy bed, so there are plenty of beds for people to have their own space. We have a lovely public golf course located walking distance! It has a restaurant, club rentals and golf carts. Situated on the canal that opens right onto the St. John's River, we have a nice gazebo, barbecue grill and small yard. We have a boat dock and lift available if you would like to use it right at the house. For large boats, there is a facility called Renegades less than a quarter of a mile that has a dock for large boats. There is also a ramp, gas and supplies. We have a large screen smart TV to watch the big game, dvd player, sound bar. In the master, there is an additional large tv with netflix and hulu. Cable is avail only on the main tv in the living room. The guest room has a small smart TV. Fully equipped kitchen includes everything you need for service of 7. Bedrooms are supplied with linens and bathrooms are supplied with towels, soap and shampoo, conditioner and blow dryers. An iron and ironing board is also there in case it is needed. New appliances include microwave, dishwasher, stove, coffee bar, fridge with ice dispenser and oven. New granite counters and open floor plan make our kitchen wonderful for cooking and entertaining. There is a laundry in the garage. The garage is not available to park your car, as we keep our car there. But there is plenty of parking in the driveway and front. There is a utility sink, new washer and dryer in the garage along with a small weight bench and weights. It is our vacation home, so we try to be sure it has everything you need - just bring your boat, golf clubs, food, clothes and positive vibe! We decorated the house with love and care, so we hope you will find peace and positive energy here. We have hotel quality linens and everything is very clean. If there is anything you need that is a special consideration, please let us know as we are happy to do what we can to make you stay amazing. Our neighbors are the best part of our house. Mostly retired, they get together for golf, pizza and sharing of good fishing. There are great walking partners, kayakers and friends! My name is Kerri and I am a photographer and graphic designer based in California and Florida. The artwork in the house is all original and mine. You may ask to order anything you see! My husband and I fell in love with this area when my parents moved here 10 years ago. They live nearby and are friends with most of the neighbors near the house. We bought this house because of the pristine nature all around it. Miles of unspoiled river, lakes and parks are right outside the door. Wild life is everywhere and a bird rookery sits near the house where you can see many exotic local birds, as well as, bird on migration. You can enjoy dining in our backyard and fish right from our bulk head. Gators, manatees and fish are everywhere. Blue hole springs dot the area and offer amazing snorkeling, spear fishing and kayaking. Words can't describe the special nature of the area - you will just have to see for yourself! The neighborhood is quiet, clean and friendly. Neighbors often get together for pizza, a game of golf or early morning fishing. It is located close to major attractions - about and hour away. So you can have you peace, or drive a bit to major cities, attractions and turquoise beaches. 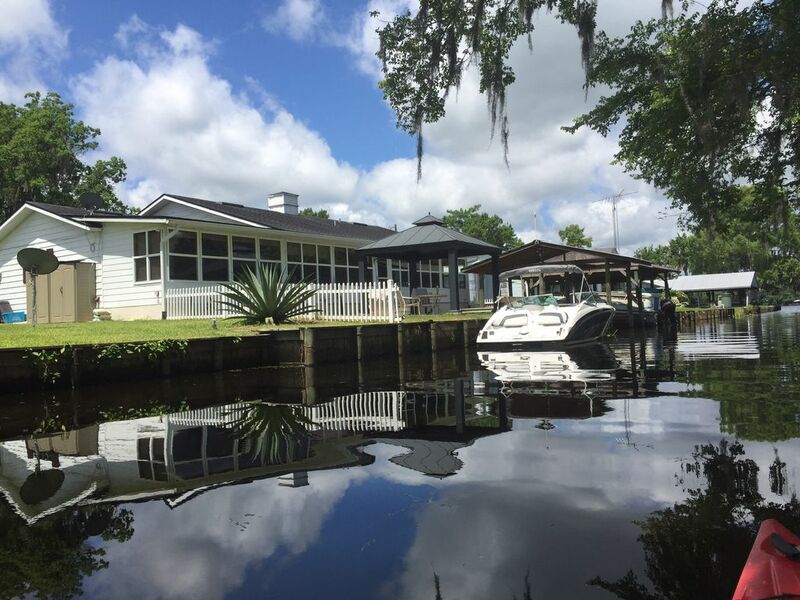 Boat dock and lift, bulk head tie up, direct access to the St. John's river, barbecue, yard, and plenty of space for a large family, two small families or 3 couples - makes this getaway easy and enjoyable. Neighbors are friendly and inclusive and ready to share a good fishing story or game of golf at the public golf course located at the end of the block. It is located on a canal - but only two houses in from the river - so travel in the boat from the house to the river takes seconds. The canal is peaceful and has good fishing right off the backyard! Back of house sits on the canal entrance to the river. Water view from all windows at rear of house. 2 cars may park int he driveway. dumb bells and weight bench in the garage. Not available for kids. Adults may use at their own risk. Bring your kayaks or canoe because are area is PERFECT! We could not have asked for a better place to stay on the water. Quick access to Renegades for live music and karaoke by boat or car and to Salt Springs and Silver Glenn Springs by boat. The house was clean and open and easy to stay. We have spread the word to our other family members about this nature escape. We will definitely be back! Thank you!! Our month long satay at the River Hose was the perfect get away for relaxing and getting back to nature. The home was well furnished and equipped with all that was necessary. It's location was quiet, full of bird watching and fishing, absolutely beautiful, yet within driving to many sites, beaches, St. Augustine, and Daytona. We have stayed in many areas of Florida. This was truly "Old Florida" and back to basics with nature, absolutely beautiful. We loved our week in The River House, and did not want to leave when it was time to go home. It is probably the most well appointed home we have stayed in. Home was super clean, and i am very picky. Great communication with owner. Loved the location. We saw bald eagles, osprey, sand hill cranes, alligators everyday. We brought our boat and spent all day every day out on the river. Home has a very nice boat house that is easy in and out. I would definitely recomend this property and will rent again. Wonderful house in a great location surrounded by natural beauty and friendly neighbors! We all enjoyed the home and really hated to leave. Homeowner stayed in touch and made sure we considered the local attractions which we did and we took advantage of our time there. Loved it! Very lovely home...clean, everything you need and super nice neighbors. We had an excellent stay. We brought our boat and were on the St. John's river in 1 minute. Wonderful places to explore on the river in both directions. We would definitely stay here again. Thank you Kerri, you are a wonderful hostess. House and location better than imagined. Exceeded all expectations. A group of my close friends decided to start an annual guys fishing trip. When looking through VRBO I stumbled upon this gem. I booked and we all got excited. The owner is very easy to communicate and willing to accommodate. Once I stepped foot in the house we all were instantly amazed how large the house is and all the amenities. The first thing in all our minds were sleeping arrangements. We are all had more than enough beds and not to mention comfortable. Once you step outside the back door you are even more amazed out beautiful the location is. There is nothing better than playing cards and enjoying a cold beverage under the gazebo at dusk. After we left, which was tough because of how relaxing the stay was, everyone immediately asked when we are coming back. If you are looking to enjoy a fantastic lake/river weekend this is the place to stay. The owner is fantastic and made sure we were having a great time. We were immediately sold on the photos when booking, but let me tell you they don’t do the house and location justice. The location is quite and very very little road traffic, which is what I would like for a week/weekend getaway. Easy access to the river or the lake. I would definitely give the house/location/stay and A+. I will recommend to all my friends and family in the future and plan to return myself. Thank you so so much Dennis! We loved hosting you. See you next time! Snow bird minimum is 4 month stay. Price to be negotiated for discount. Quiet is expected with no parties are additional guests without our consent. We have to the right of refusal for any guest.